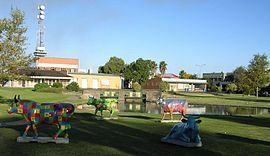 Shepparton (/ˈʃɛpərtən/) is a city on the floodplain of the Goulburn River in the north east of Victoria, Australia. It is about 181 kilometres (112 mi) north-east of Melbourne. In 2006 there were 27,707 living in the city. Shepparton began as a sheep station and river crossing. It later became an important railway town. Today it is an agricultural and manufacturing city. It is at the centre of the Goulburn Valley irrigation system, one of the largest centres of irrigation in Australia. It is a major regional service city and is the civic administration centre for the City of Greater Shepparton. 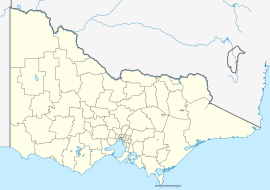 The Greater Shepparton area includes the towns of Tatura, Merrigum, Mooroopna, Murchison, Dookie, and Grahamvale. ↑ "2011 Census Community Profiles: Shepparton Mooroopna". ABS Census. Australian Bureau of Statistics. Retrieved 15 September 2016.